"Given to me by a close friend and is pretty much amazing. Even better heated up the next day." Heat olive oil in Dutch oven or deep skillet over medium-high heat. Saute chopped onion, green bell pepper, red bell pepper, and garlic in hot oil until tender but not yet browned, 5 to 7 minutes. Pour chicken broth over the vegetable mixture; season with chili powder, cumin, salt, and black pepper. Place a lid on the pot, reduce heat to medium-low, and simmer for 30 minutes. 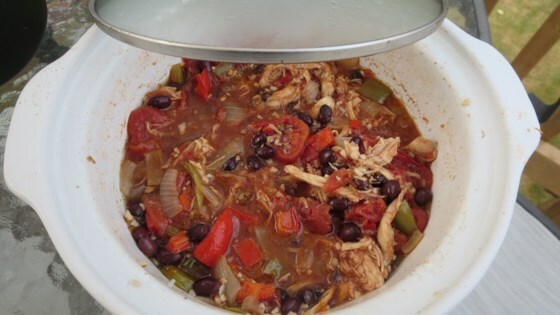 Stir black beans, stewed tomatoes, and chicken meat together in a separate pot over medium-low heat; bring to a low simmer. Stir the vegetable-broth mixture into the black bean mixture. Bring again to a simmer and cook, adding water as needed to keep the mixture from becoming too dry, until the flavors blend, at least 30 minutes. You can use rotisserie chicken from the grocery store; that is what I use.